NC Hills Autonomous Council (NCHAC) chief executive member (CEM) Debolal Gorlosa on Saturday said ‘no one can stop development in the district (Dima Hasao) now’. 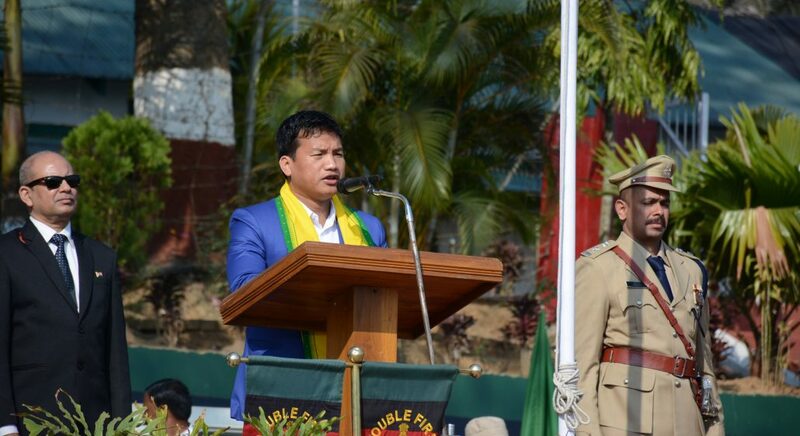 The CEM of NCHAC, Debolal Gorlosa said this while addressing the 70th Republic Day celebration at Haflong, the district headquarters of Dima Hasao. “No one can stop development in this district now and I am sure the people of Dima Hasao will see better days in next five years with all people friendly schemes we have under the leadership of our Hon’ble Prime Minister and Hon’ble Chief Minster,” promised CEM Gorlosa. The central cerebration of the 70th Republic Day of the country was organised at the Kendriya Vidyalaya Playground near Assam Rifles in Haflong with full enthusiasm. Gorlosa hoisted the tricolour accompanied by Dima Hasao deputy commissioner Amitabh Rajkhowa and the newly-posted superintendent of police, Sreejith Thiraviam. The Republic Day was simultaneously celebrated in other parts of Dima Hasao including Maibang sub-division. At Maibang sub-division, civil SDO Manojyoti Kutum unfurled the tricolour in Dishru playground accompanied by Maibang SDPO, Padmanabh Barua. The day’s programme began with the ceremonial flag hoisting after swahid tarpan by the CEM, DC, SP and other guests followed by singing of National Anthem by the students and inspected the participant contingents. Addressing the crowd, the chief guest of the programme, Gorlosa thanked the public of Dima Hasao for voting the people of his party as members of the autonomous council in the recently-held 12th NCHAC election. Many colourful dances were performed on the occasion by various communities of the district. Thousands of people gathered at the venue of Republic Day celebration and many awards were also distributed during the ceremony. A beautiful pipe band performance was presented by each group of St. Agnes’ Higher Secondary School and Assam Rifles. A group of teachers from different schools also performed a skit written by Dibarai Mahila Samity on the theme ‘Beti Bachao Beti Padao’. A prize of appreciation was received by the participants of the contingents from the VIPS. Towards the end of the programme, declaration of the winners of the march past was made. St. Agnes’ Higher Secondary School begged the first prize among the contingents followed by Don Bosco Higher Secondary School and Girls’ Higher Secondary School in second place and Kendriya Vidhyalaya in third place. The programme was attended by the newly-elected members of the autonomous council including officials from the district administration and NCHAC, Haflong, Army and Assam Police, officers from various departments, senior citizens, NGOs, students, etc.